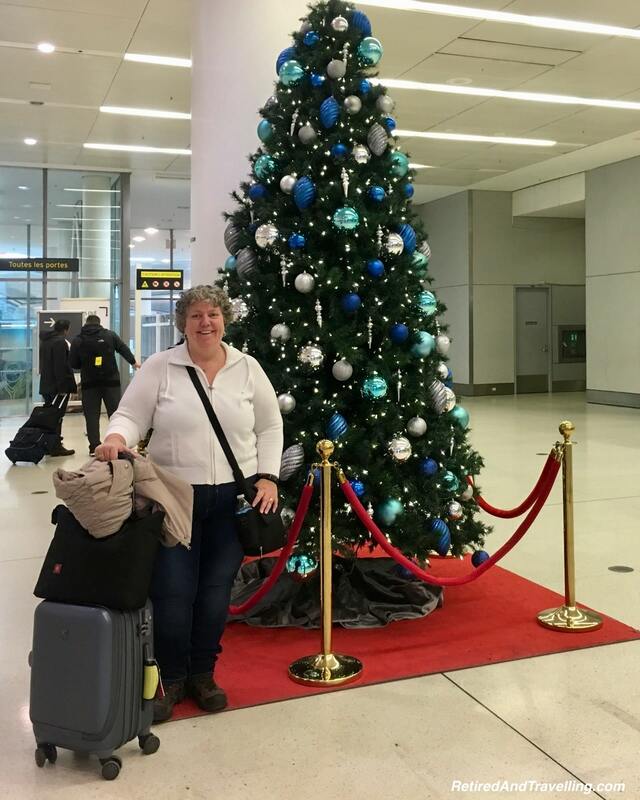 We were home in Toronto for most of the fall after we returned from our Baltic cruise. But that didn’t mean we were staying put. A mid-week trip to Chicago was a great break from routine. 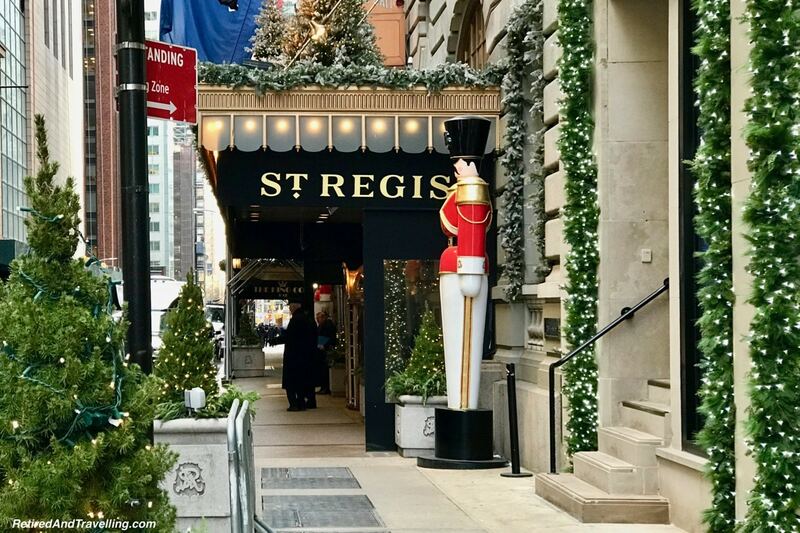 We planned a a holiday visit to NYC (New York City) in December to kickstart our Christmas spirit. As we did our final packing to leave out the door, a news banner flashed on the tv about a bombing in NYC. Several blocks around Times Square were cordoned off. 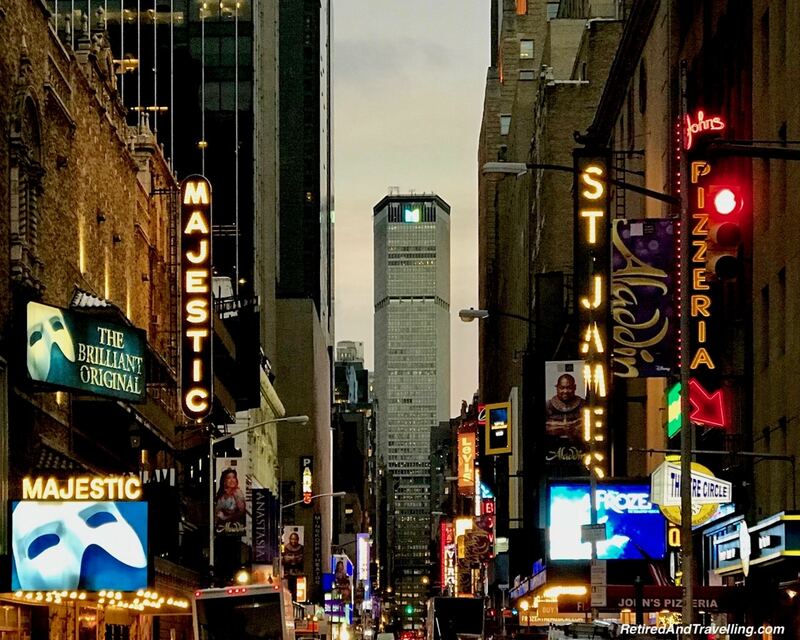 Two blocks from the Intercontinental Times Square where we were booked. Concerned friends suggested we cancel our trip. But we were not going to let the crazies win. 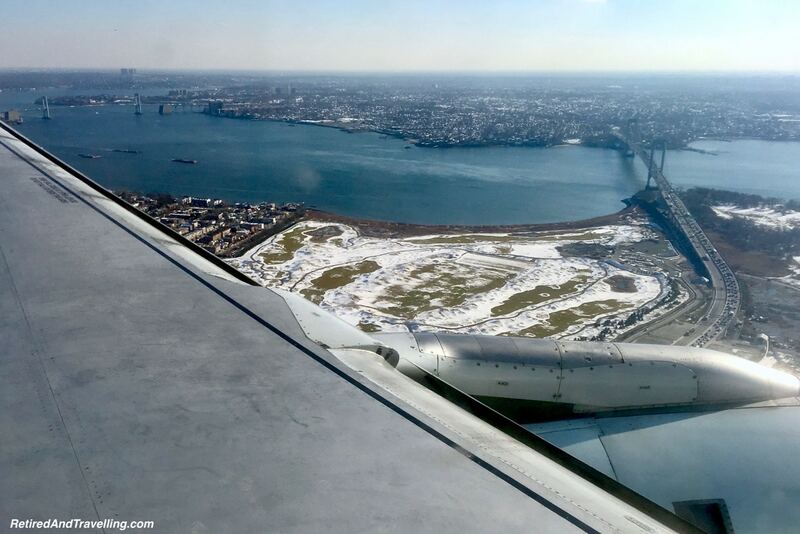 It was a surprisingly easy travel day to NYC. By the time we reached our hotel, there seemed to be a little extra police presence. But NYC had returned to normal. We had to laugh the next day when we heard shouting under our window. 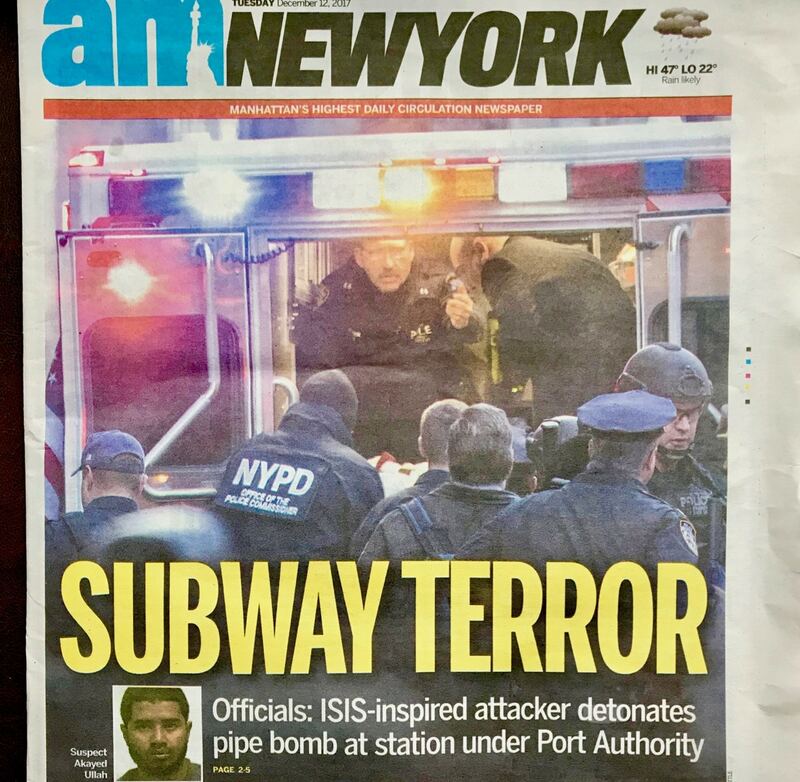 We hoped it was not another bomb incident. But it was just a long line of kids protesting. 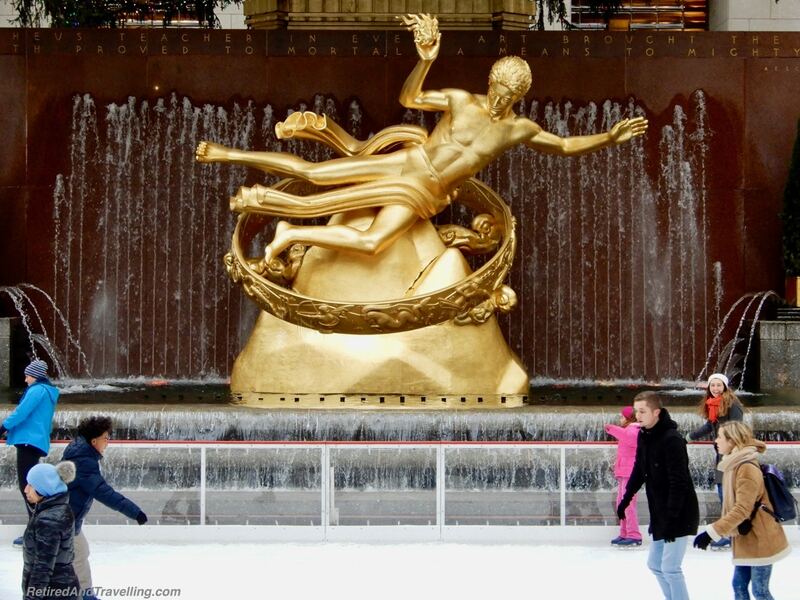 Gotta love the resiliency of New Yorkers!!! 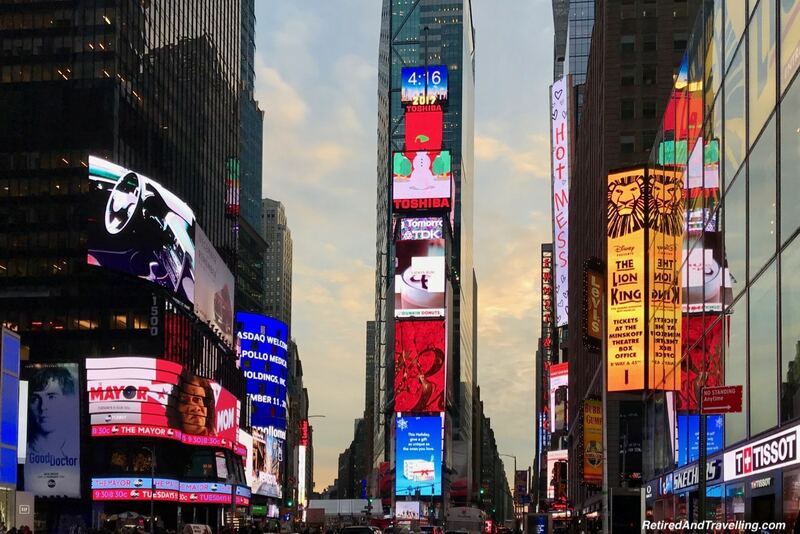 No trip to NYC is complete without a stop in Times Square. Our hotel was only a few blocks away. We strolled through during the day and it was fairly quiet. When we passed by after dark it was dazzling and as bright as day. 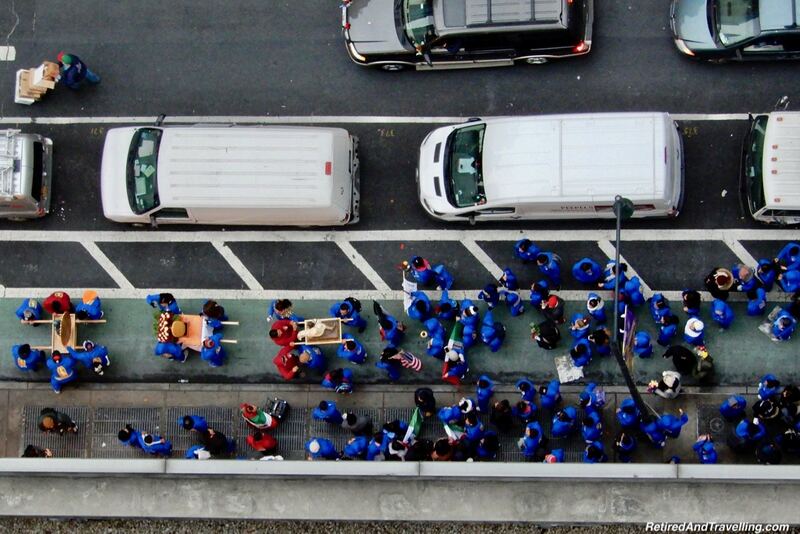 Street performers drew large crowds. People’s heads swivelled. And the locals just kept walking. We joined people up on the bleachers for the perfect shot of the chaos. On a holiday visit to NYC, we found Time Square to be filled with other tourists out to enjoy the city all dressed up. 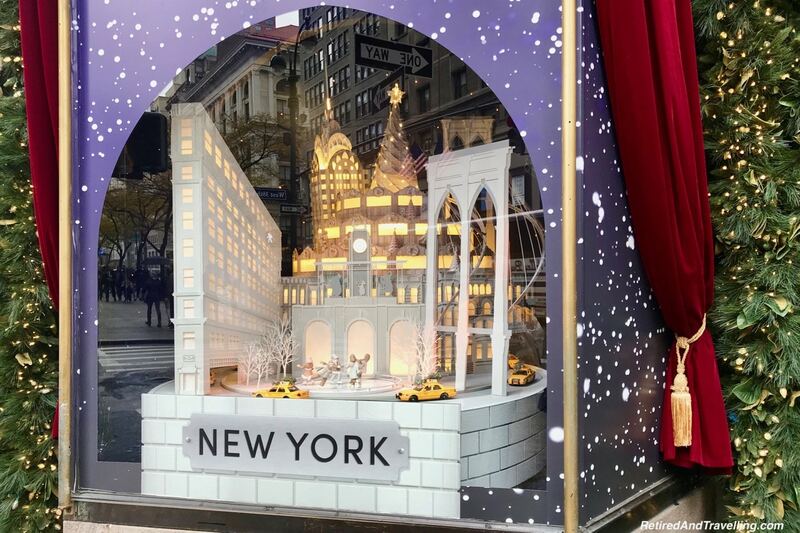 When we planned our NYC trip, Lynn from @MadHattersNYC provided us with a great walking route to see the store windows all dressed up for the holiday season. 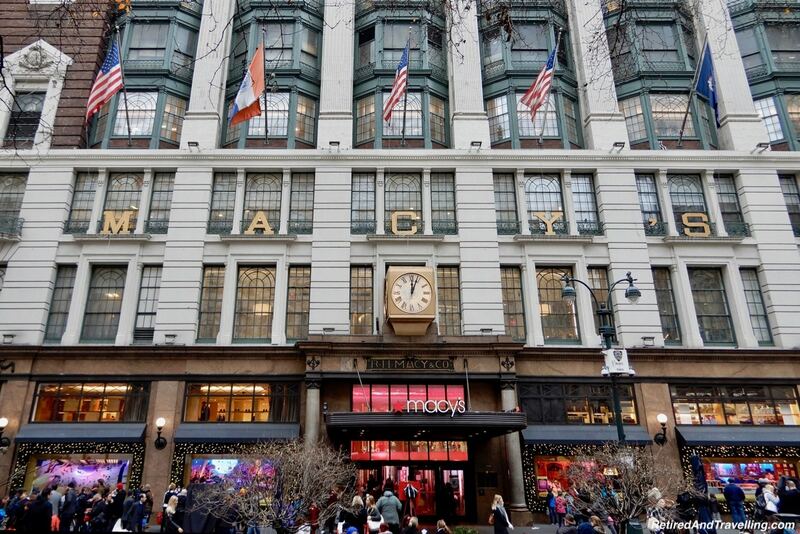 The iconic Macy’s store was our first stop. 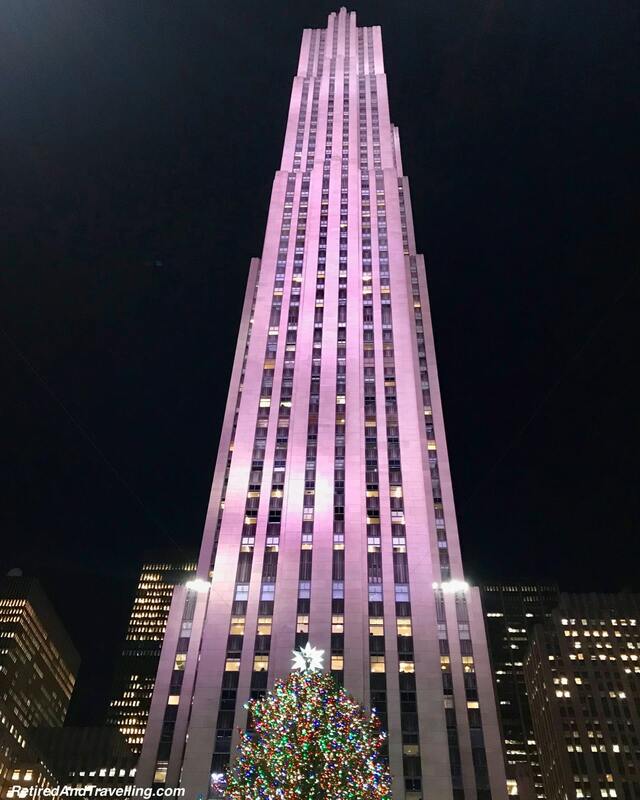 It was a great way to start our holiday visit to NYC. We stood fascinated with the other kids and watched the animated displays. Wandering inside we saw sparkle everywhere we looked. The ceiling decorations sent inspiring messages. 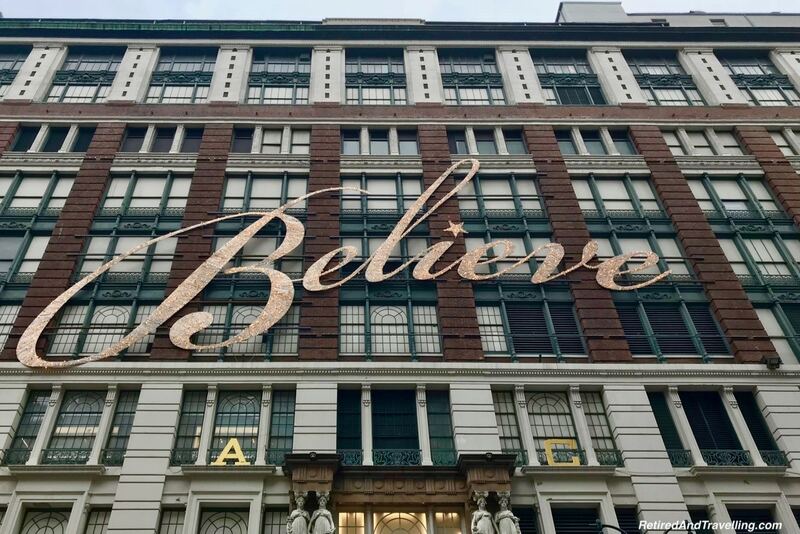 As fans of the Christmas special “Miracle on 34th Street”, we were reminded to “Believe”. 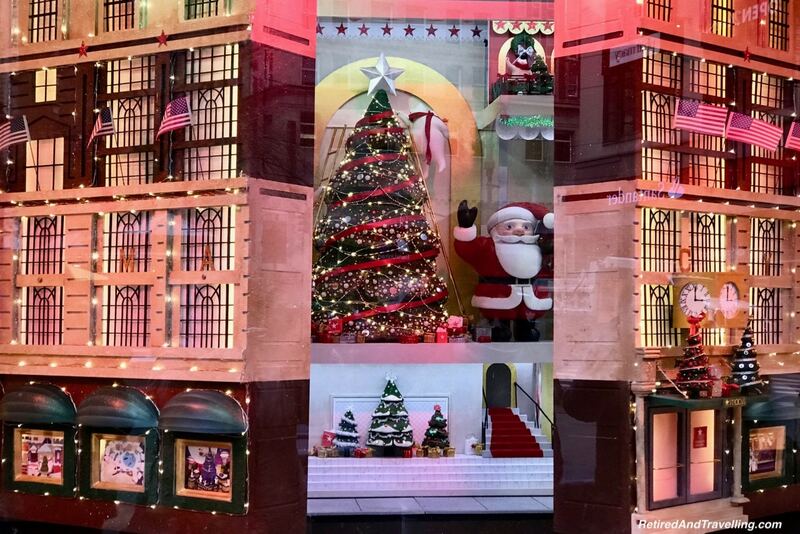 We checked out the Santa at Macy’s. I might have even sat on his lap for a Christmas wish. But we did not do an online reservation in advance. From Macy’s we headed up Fifth Avenue. 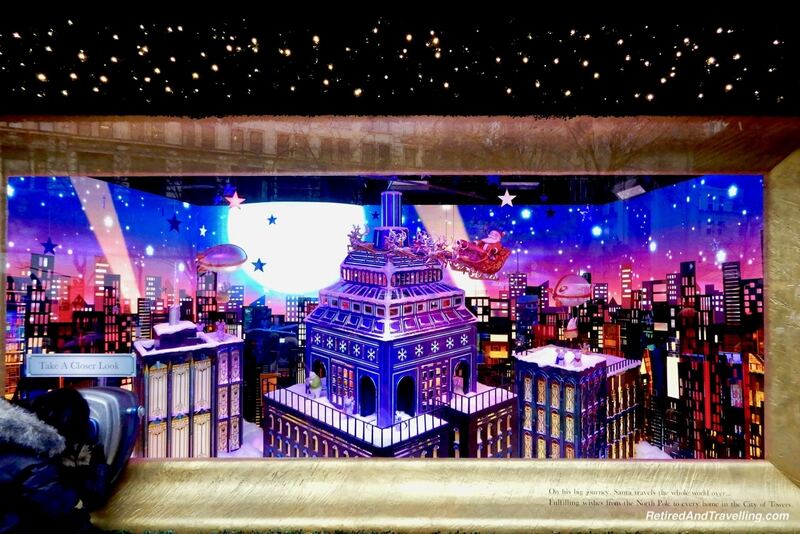 Store windows at Saks Fifth Avenue, Bergdorfs and Lord & Taylor were decorated with different themes. 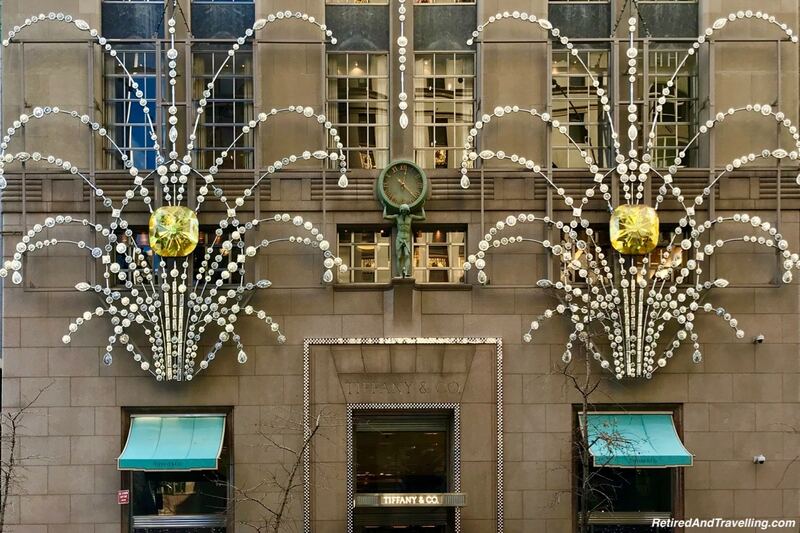 The Tiffany store sparkled with gems. 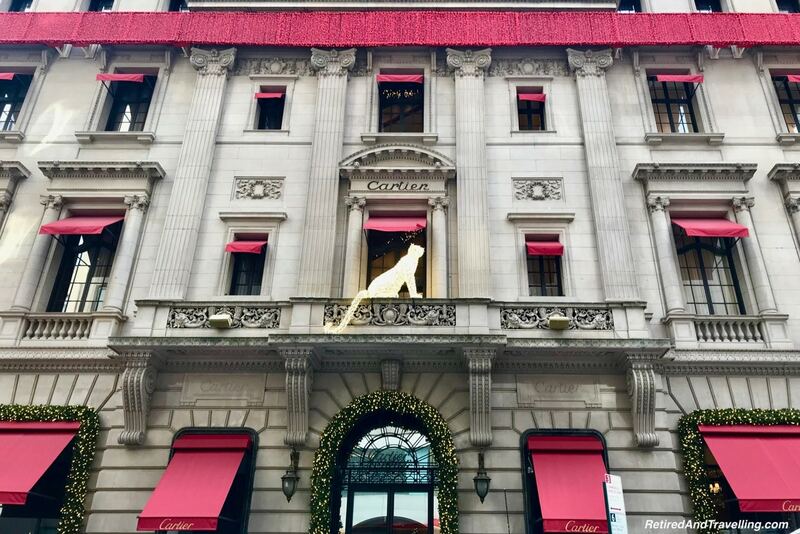 The Cartier cat was just one of the decorations we stopped at. And hotels were decorated in holiday colours. Our walking path took us past Central Park. We had originally planned to take a horse and carriage ride through the park. But it was too bitterly cold to enjoy. 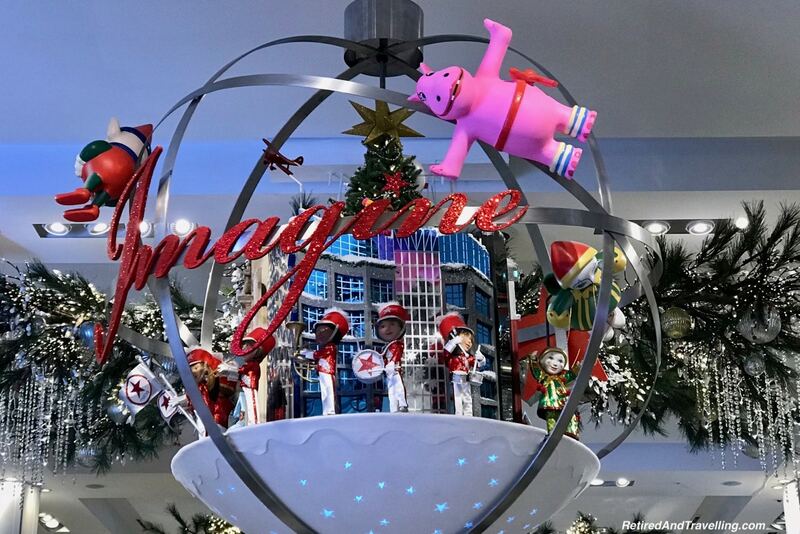 The final stop for us was Bloomingdales. 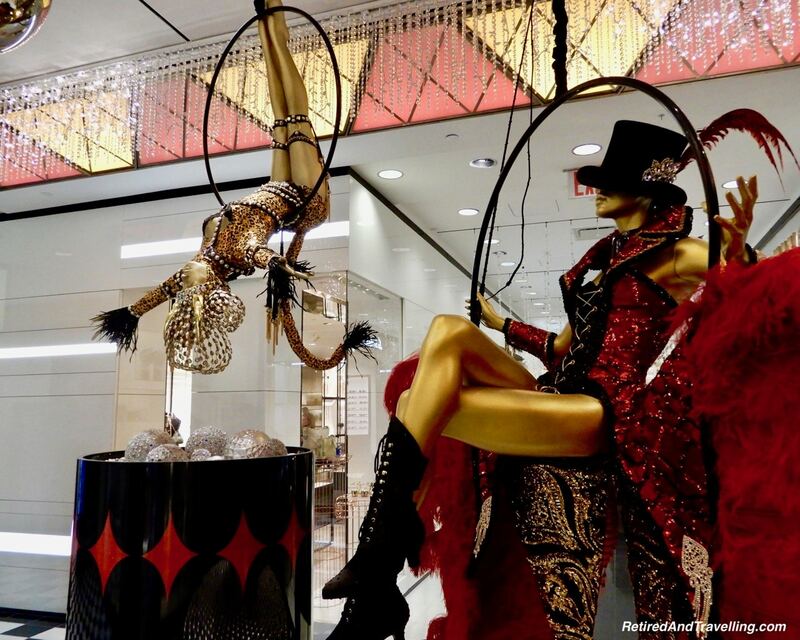 A circus theme showed up in the windows. When we went in the store, this theme was further shown in displays around the store. 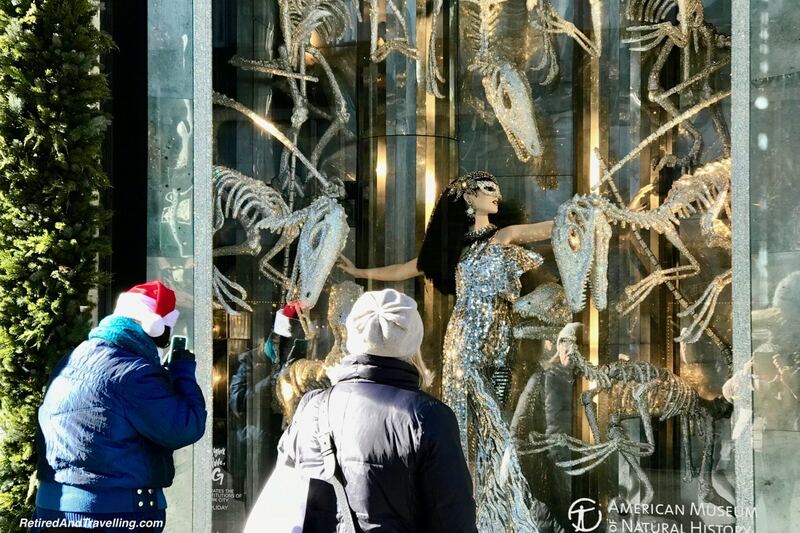 A tour of the store windows decorated for the season was a perfect way to start a holiday visit to NYC. 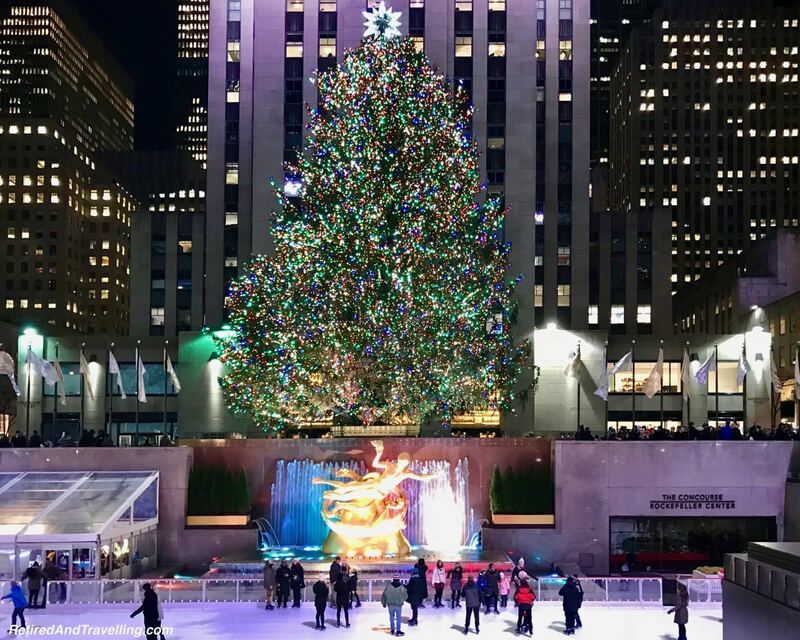 The giant tree and skating at Rockefeller Centre are iconic holiday symbols of the holiday season in NYC. We made our first trip in daylight. The tree was indeed large. 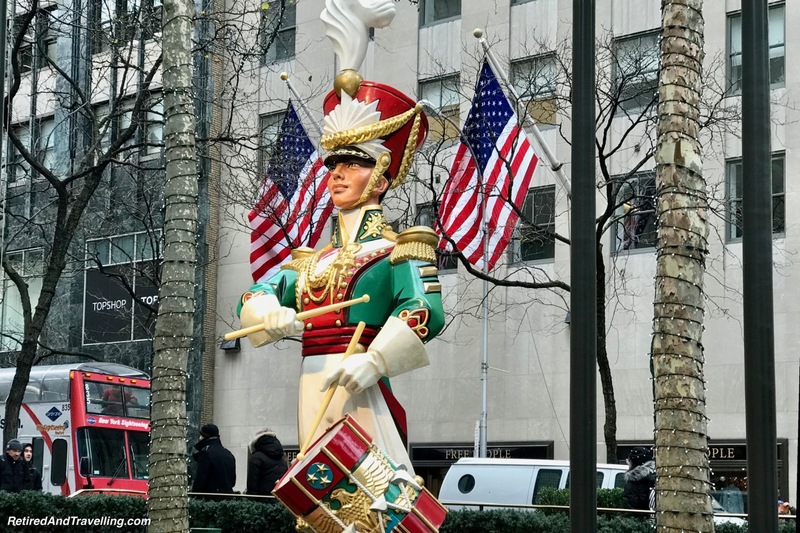 Giant toy soldiers were positioned around the sides. Angels decorated the median down towards Saks Fifth Avenue. We watched the skaters on the ice rink. It was quite expensive and the line ups were long. 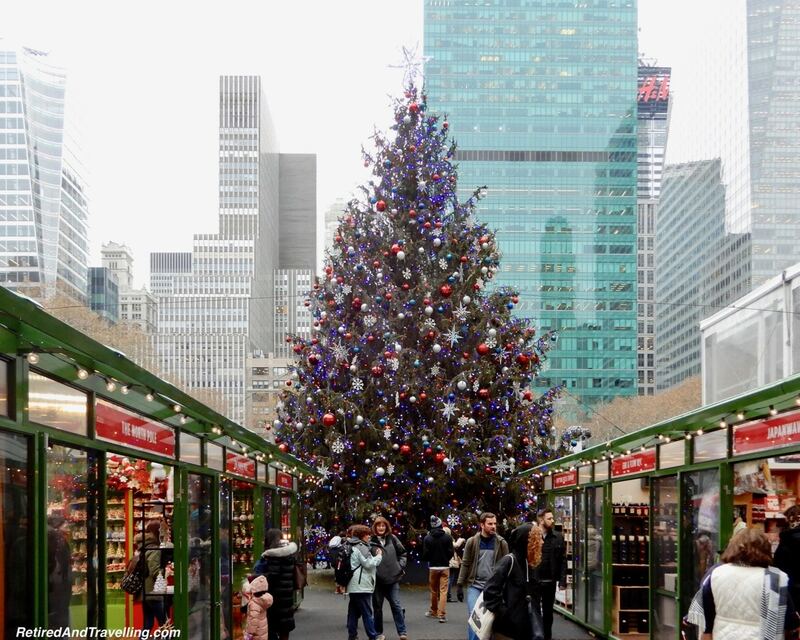 Later on our visit, we also visited the ice rink at Bryant Park. Surrounded by a large Christmas Market, this is probably a better option if you want to skate. 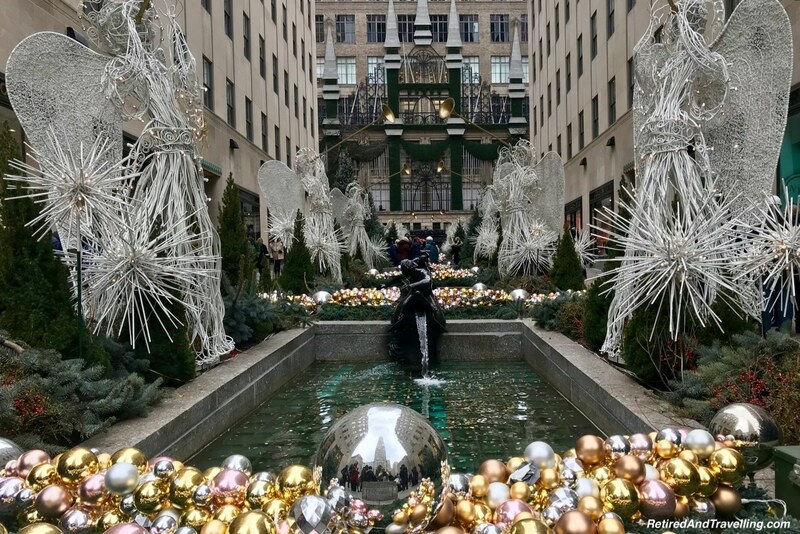 When we returned to Rockefeller Centre after dark one night, the nice holiday decorations took on a much more magical glow. 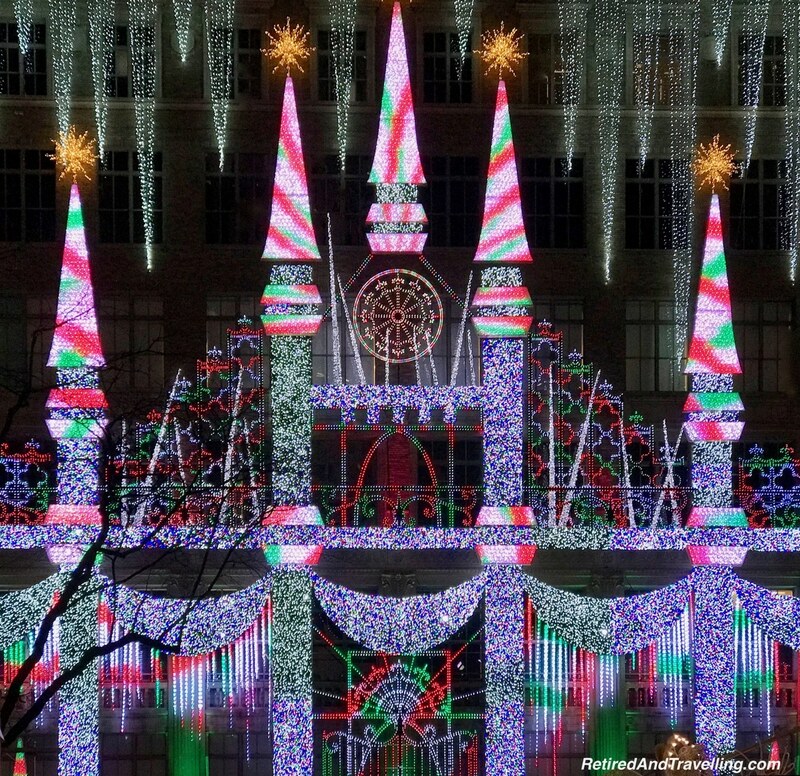 Make sure you take in the holiday displays after dark. It really does add a different perspective. 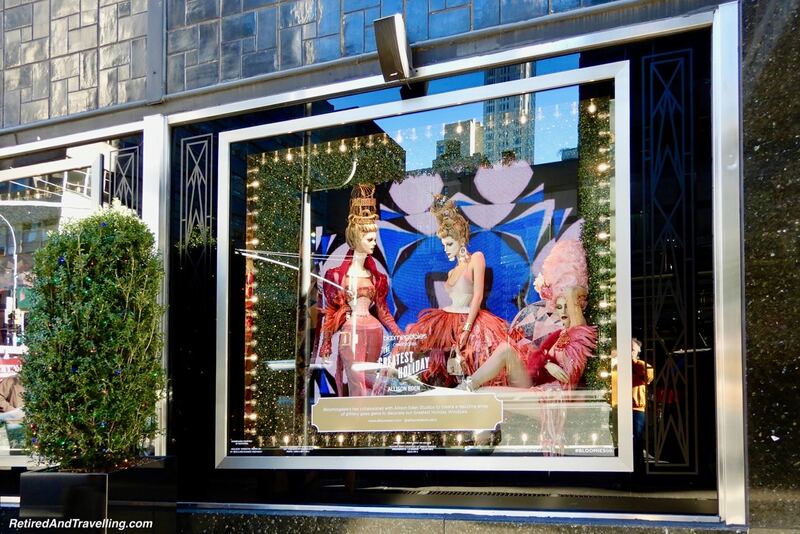 When we saw Saks Fifth Avenue during the day, it was evident that there was a light display all up the wall. When we went back at night, we were delighted when this wall sprung to life. A light and music show entranced us for several minutes. 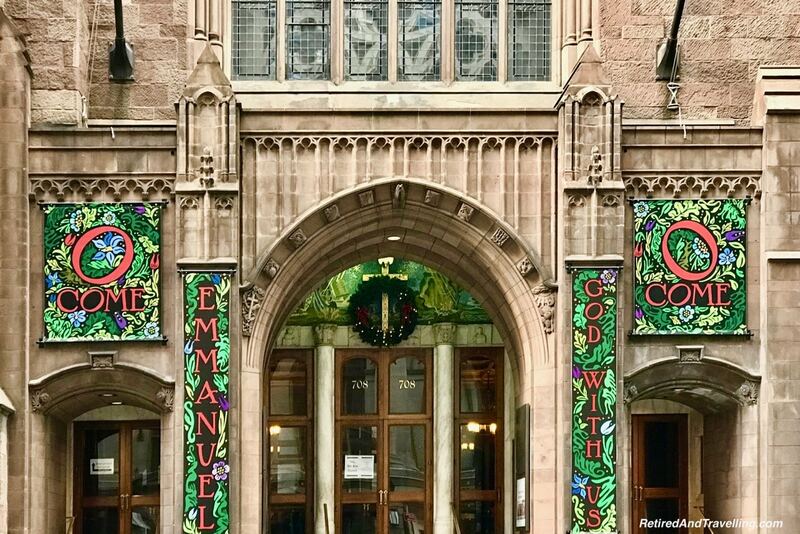 That may have been our favourite part of our holiday visit to NYC. 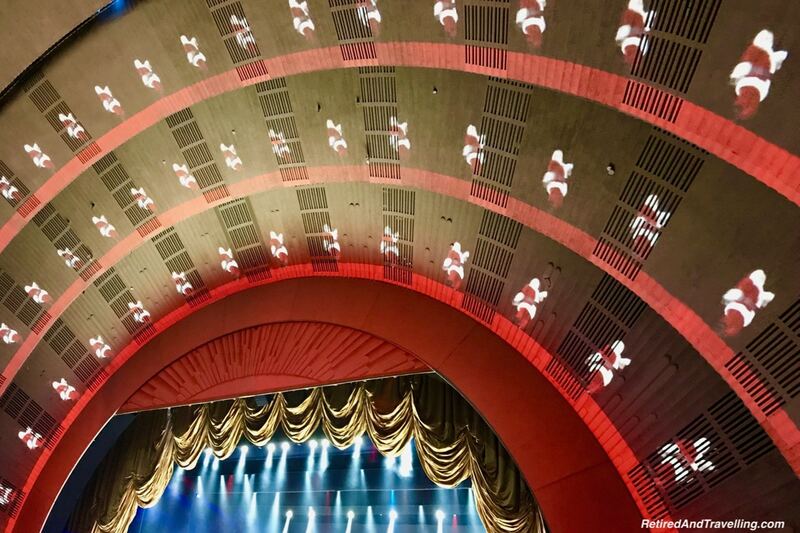 When we wandered around at night, we got our first glimpse of Radio City Music Hall. 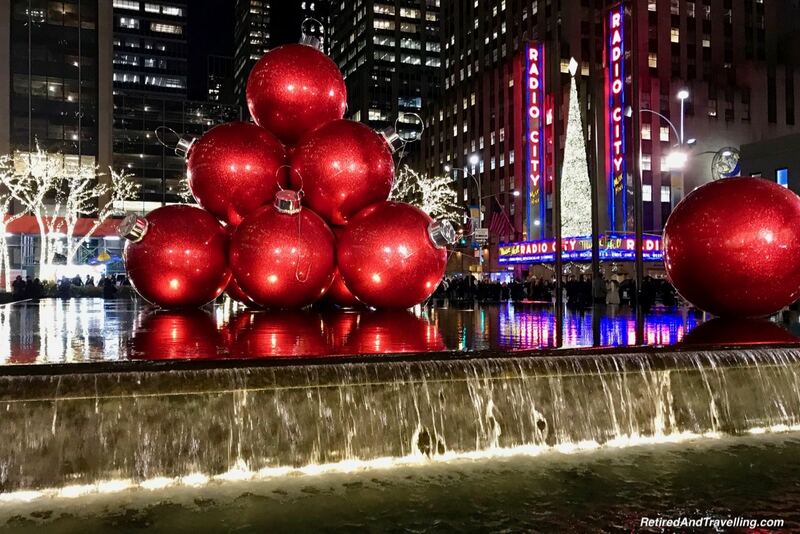 This iconic NYC site was situated close to a series of giant Christmas ball decorations. It was easy to frame a perfect shot. 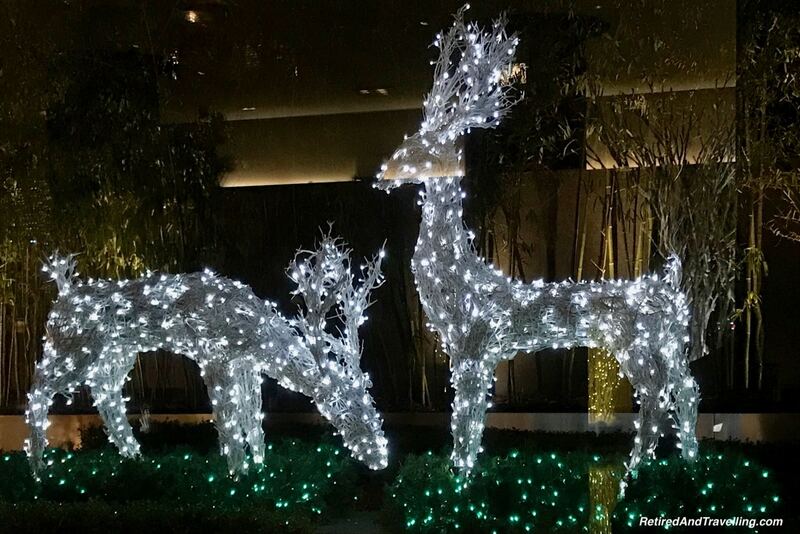 As we walked further in this area, we found a giant set of Christmas lights. 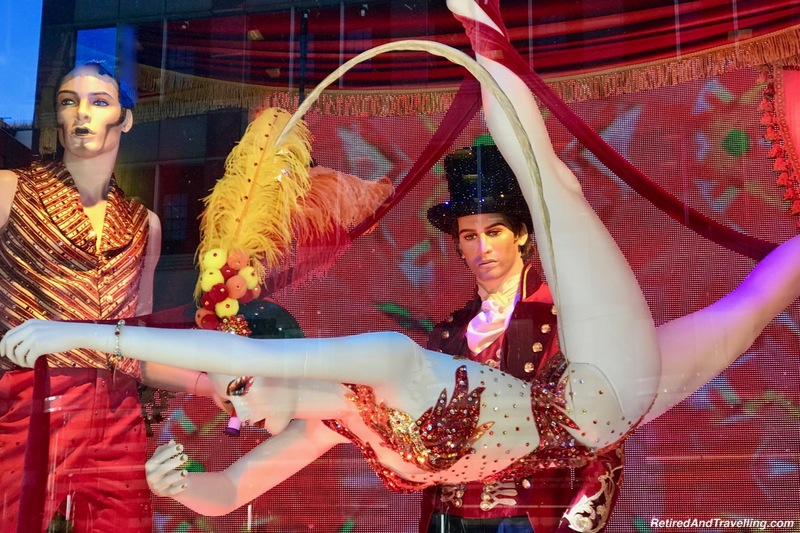 We visited NYC before and never saw a Rockettes show at Radio City Music Hall. So we got tickets for the Christmas Special. This was a great treat on our holiday trip to NYC. While tickets were available from the last minute ticket agents, it was easy to pick up tickets right at the box office. Just don’t show up just as a show is going in! 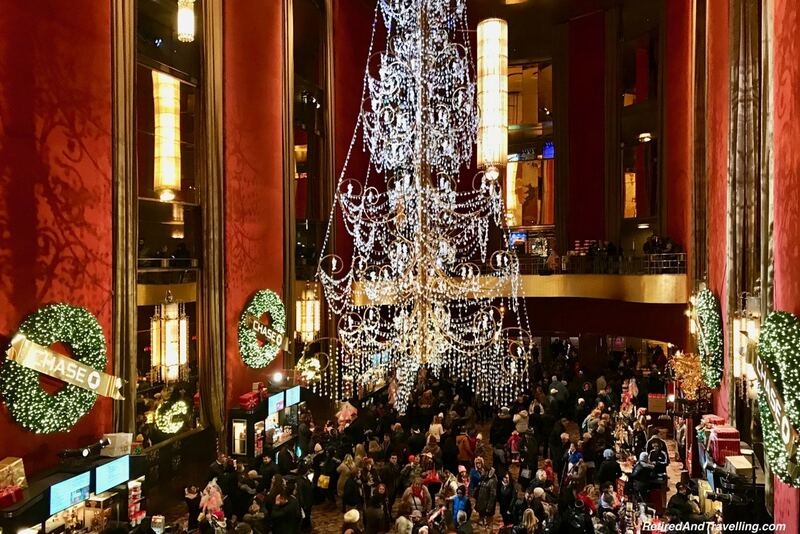 The lobby of the theatre was decorated for the season. There was even a Santa for kids of all ages to visit. 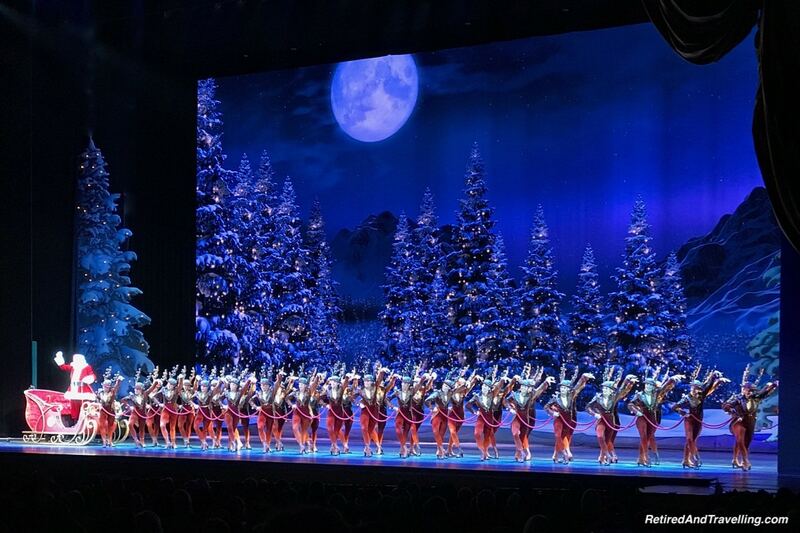 The Rockettes Christmas Spectacular was a fun night out. 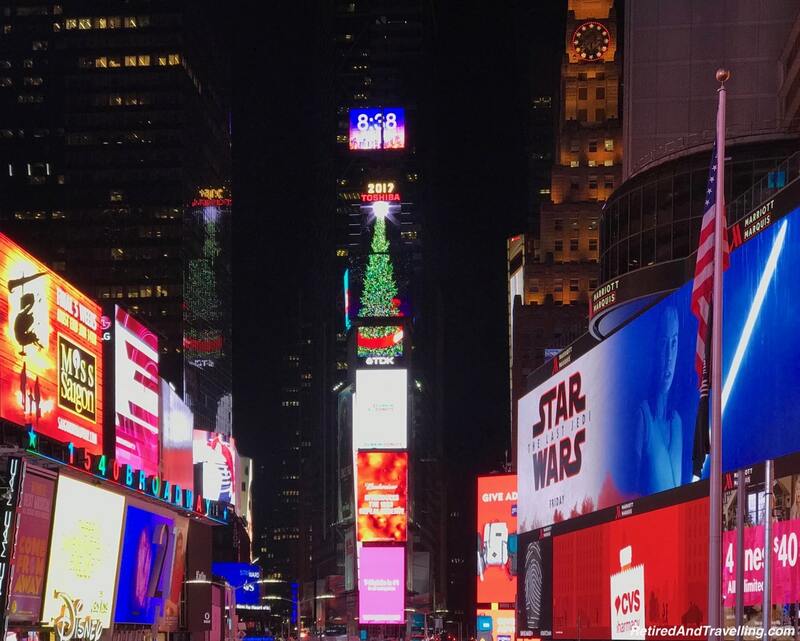 We donned our 3D glasses and watched Santa and his reindeer fly over NYC. Then Santa passed right by our orchestra railing seats that David had snagged. Santa even shook my hand before he arrived onstage. 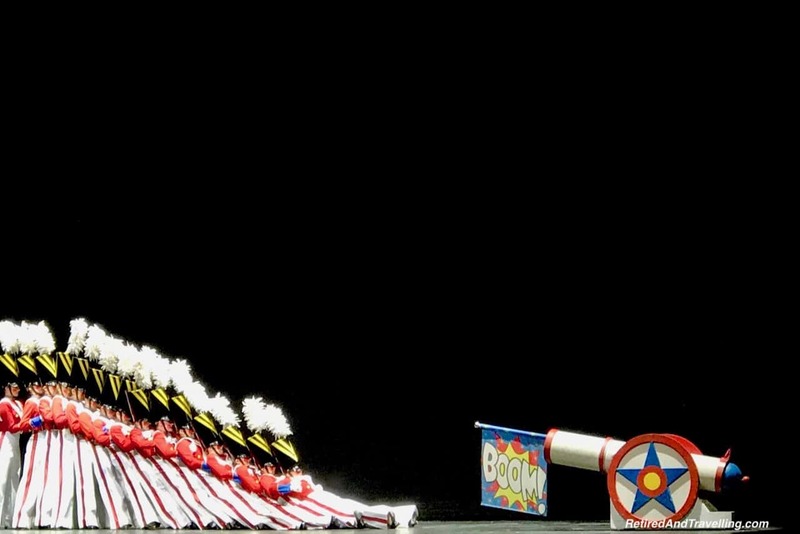 He was soon joined by his line of Rockette reindeer. We were glad we had seats a bit back from the stage. A light show lit and changed the view of the entire stage area and front of the theatre. 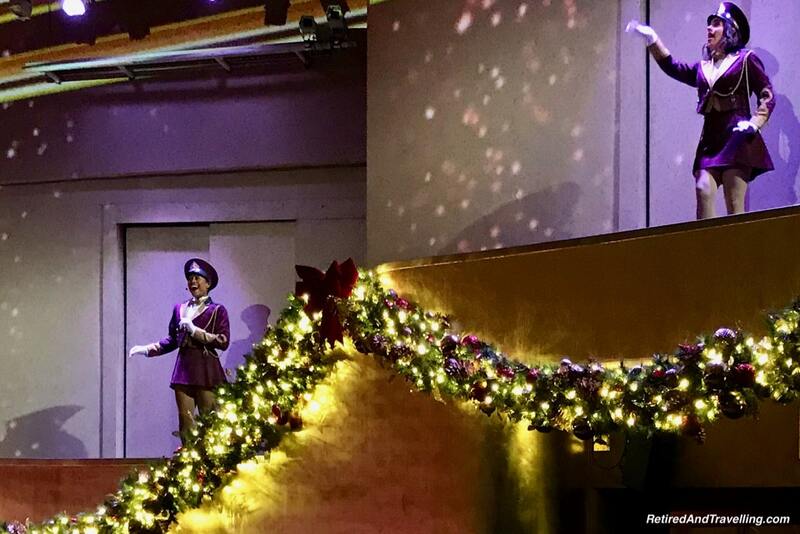 Santas danced on the ceiling, holiday wreaths and candy canes ringed the stage and different scenes played out on the walls. 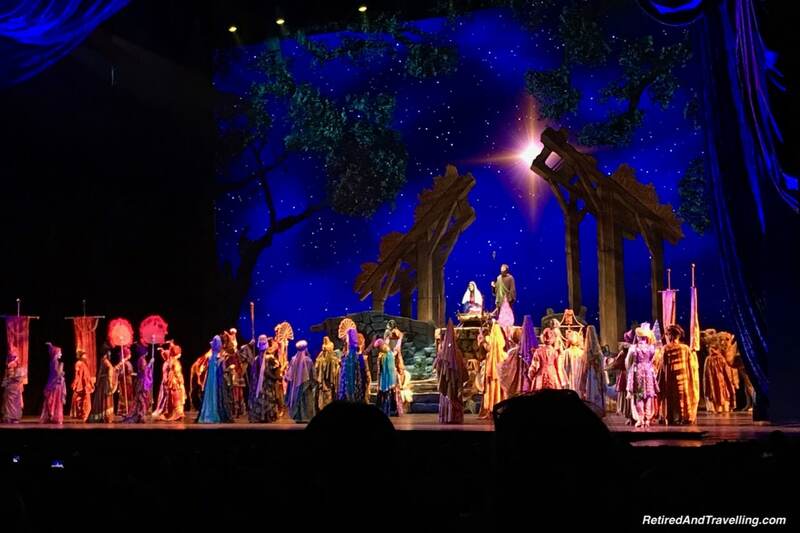 Characters sang throughout the theatre and side stages. There were singing and dancing numbers by the Rockettes and other players. All were in the holiday spirit. The final number was the story of Jesus. I must admit to being a little surprised to see this religious story included. But it was pulled off in line with the other numbers. We left the theatre singing holiday tunes. 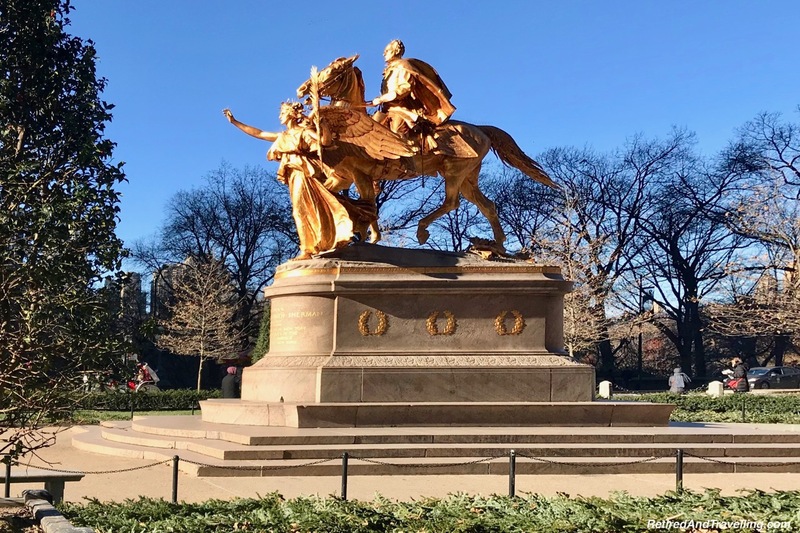 This was a great addition to our holiday visit to NYC. 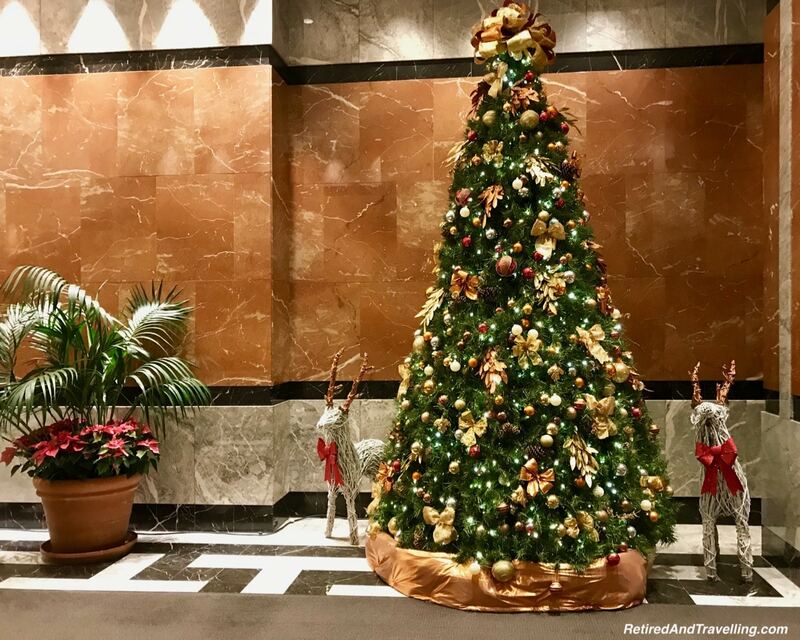 If you need a boost to your holiday spirit, we found it everywhere in NYC. Our hotel was fully decorated. 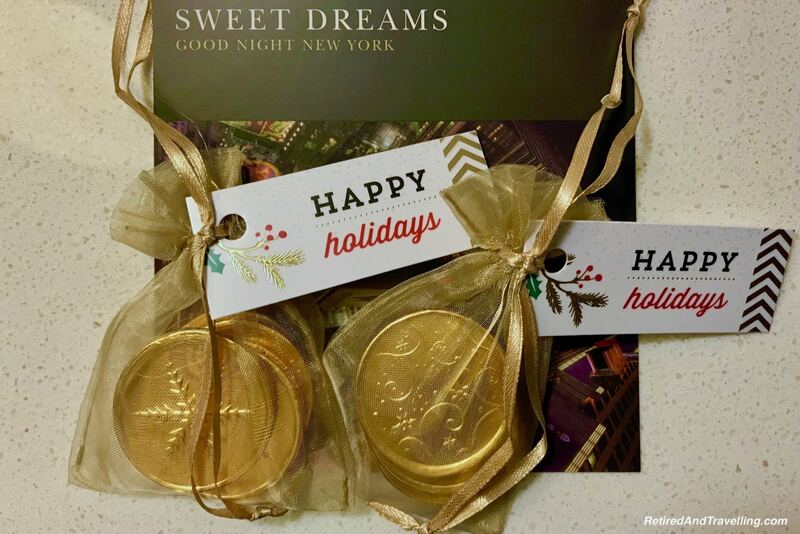 Even the nighttime chocolates came with a holiday message. 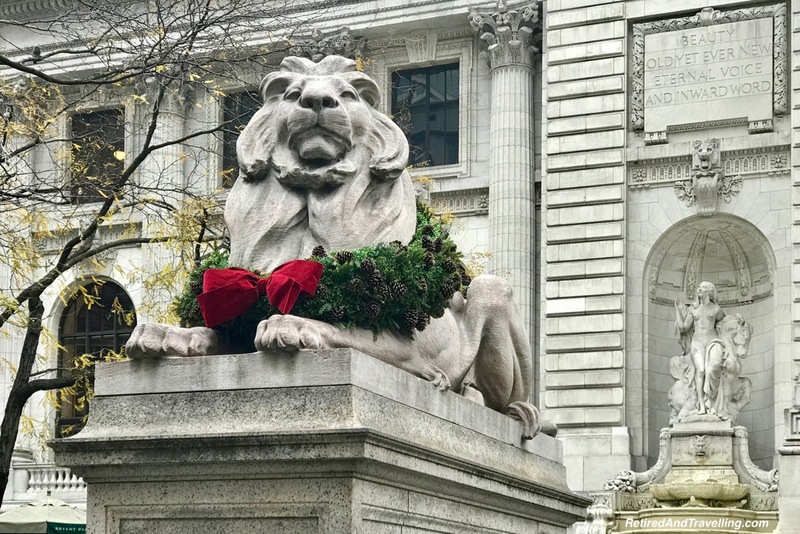 When we wandered by the NYC Public Library, the lion statues had holiday ribbons. 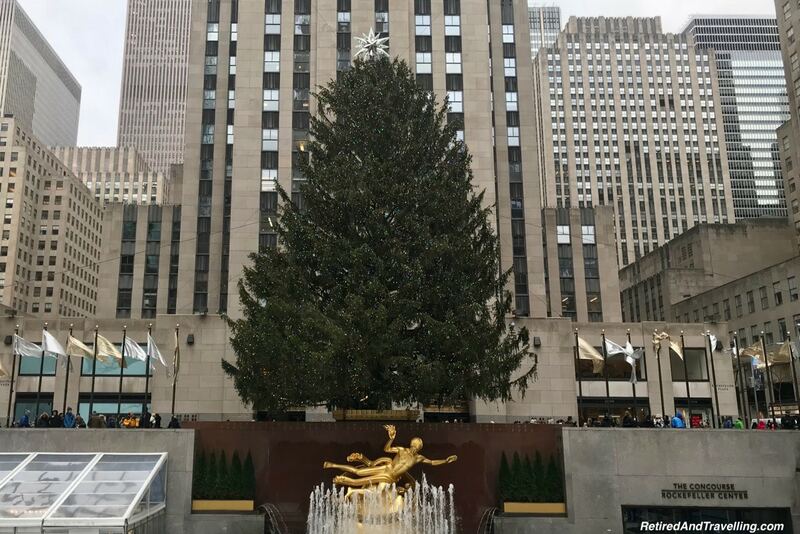 Every public space and hotel we visited had massive Christmas trees on display. 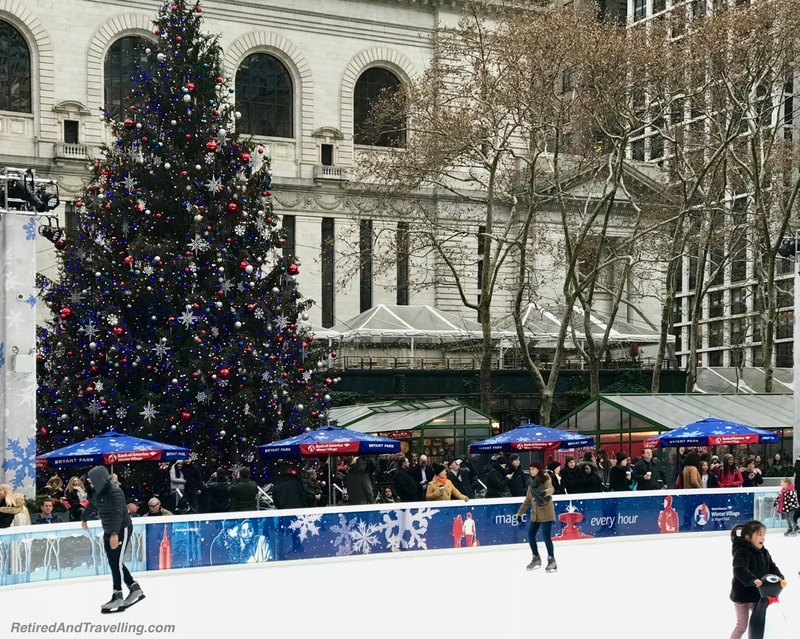 There was skating and a large Christmas market at Bryant Park. But we also saw several other Christmas markets that took over the streets. Churches were decorated on the inside and outside. 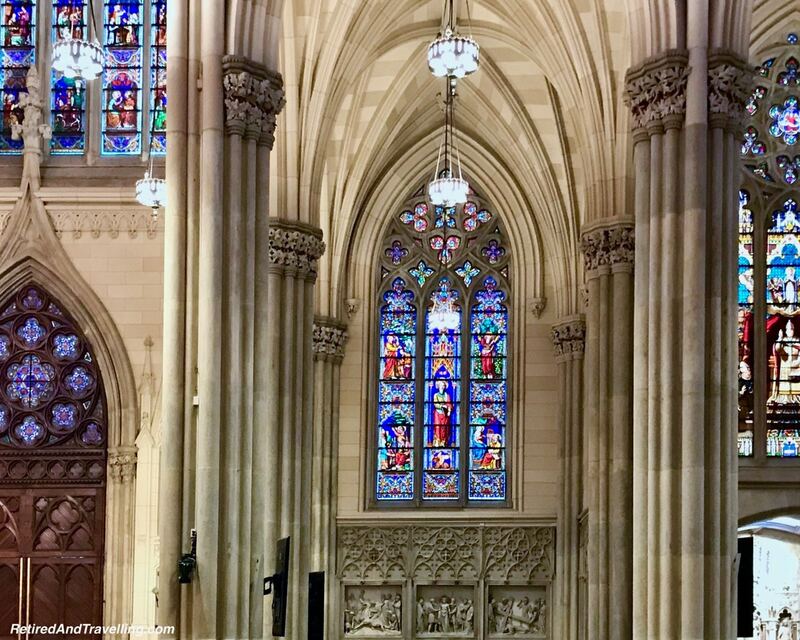 The 5th Avenue Presbyterian Church beckoned us inside. 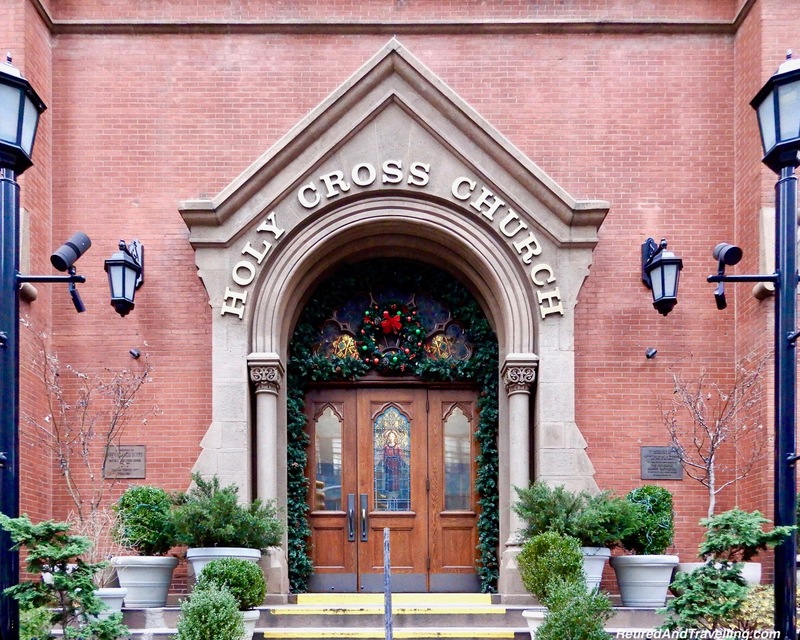 The Holy Cross Church was simple on the outside but beautiful and artistic inside. 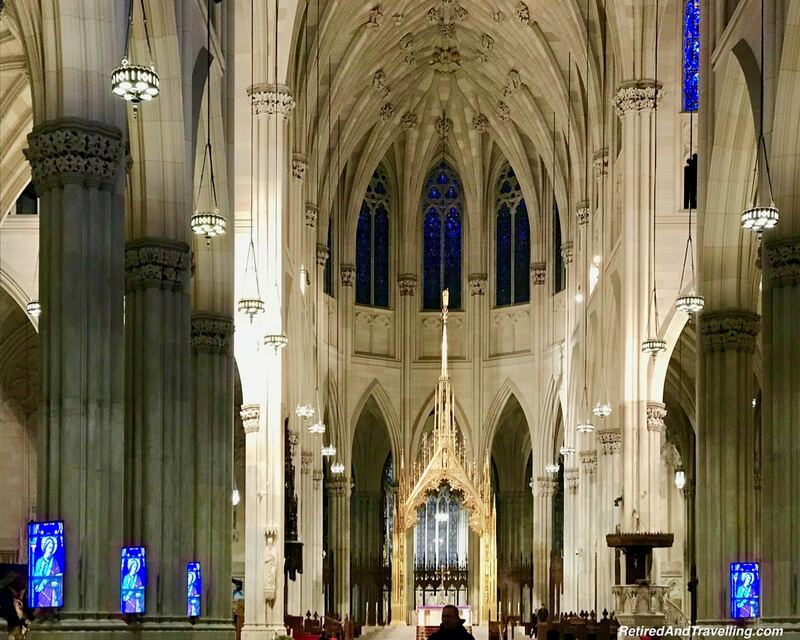 When we stepped inside St Patricks Cathedral, we had a brief respite from the glitter of Christmas decorations. 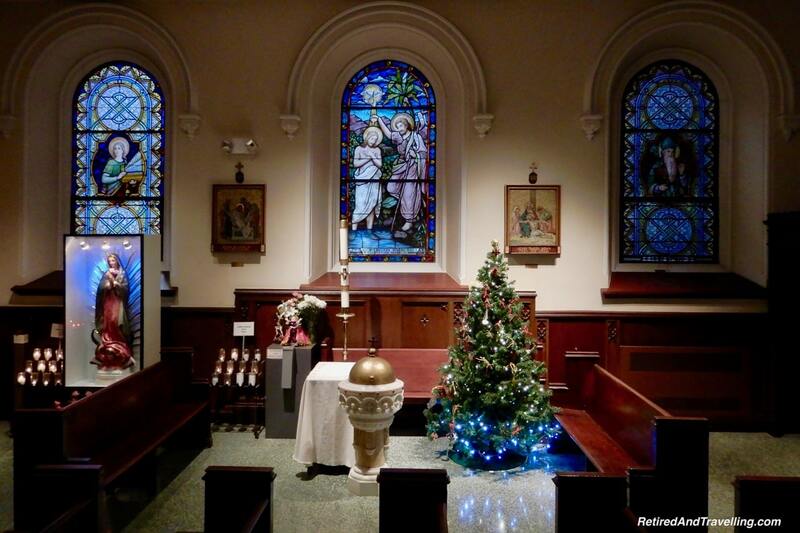 This beautiful church reflected the colours from a multitude of stained glass windows. 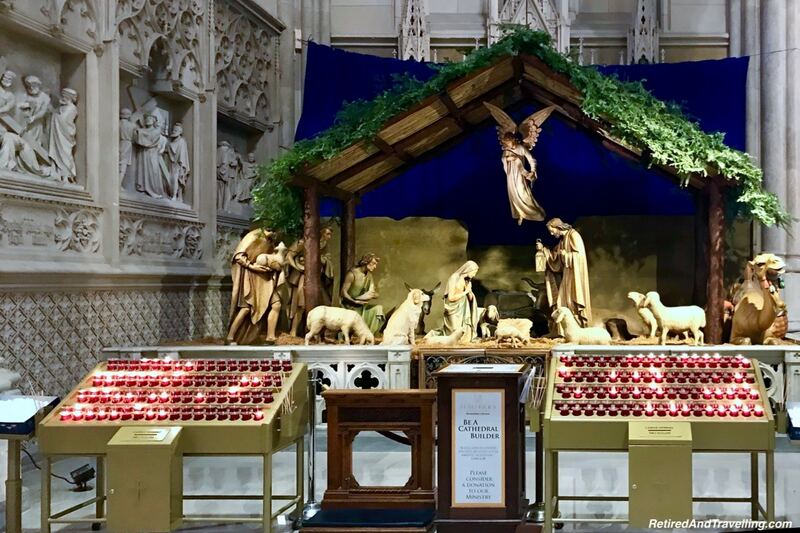 But we did find a display for Jesus in the Manger. 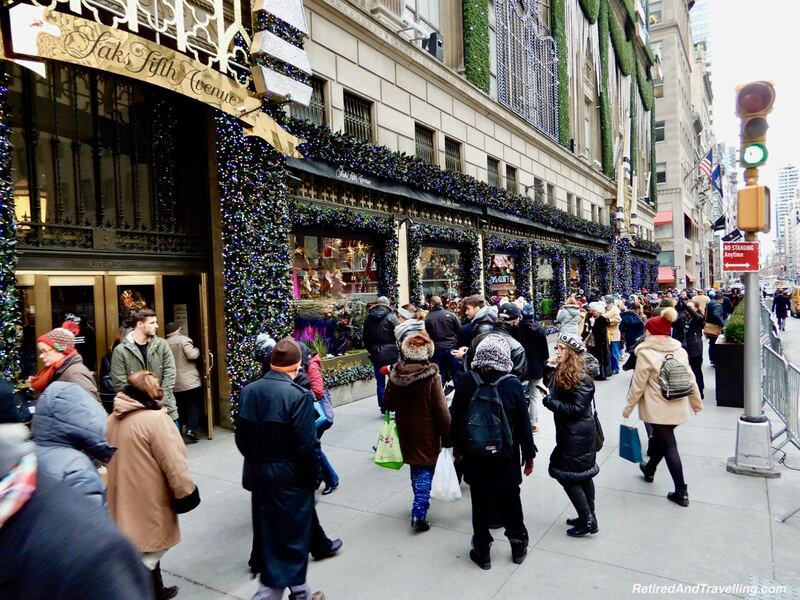 If you want to find holiday spirit in NYC, it is never far away. 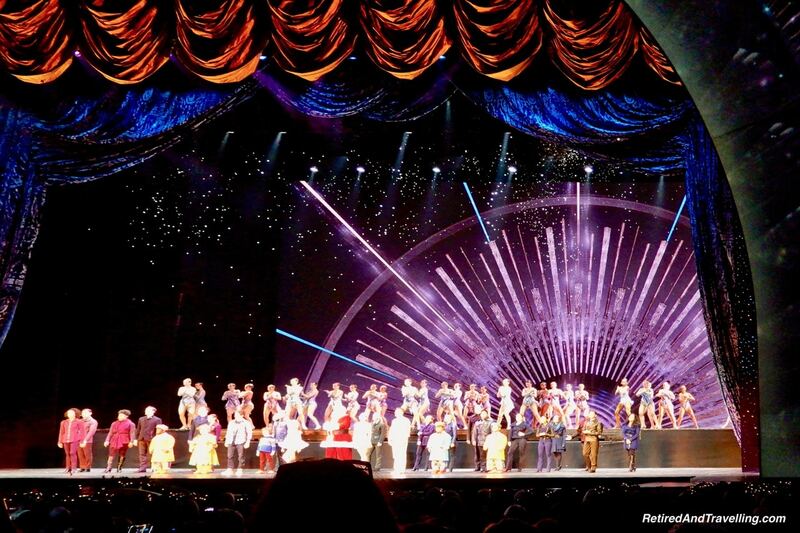 I saw my very first professional live theatre production (42nd Street) on my first visit to NYC (a long time ago). Nothing will ever recapture the magic of that first show. I have seen major productions around the world. And Toronto gets its share of great live theatre. But when we return to NYC, we always do at least one show. We had a long list of shows we were interested in. We started at the main last minute ticket booth (TKTS) and got wooed into one of the new competitors. There was a good range of tickets for many shows. We finally chose to see a new production called The Band’s Visit. It might be years before this showed up in Toronto. We enjoyed our night out at the theatre. The show was less glitzy than many others playing at the time. The music was good and the encore performance made me wish we had heard more of the band during the show. 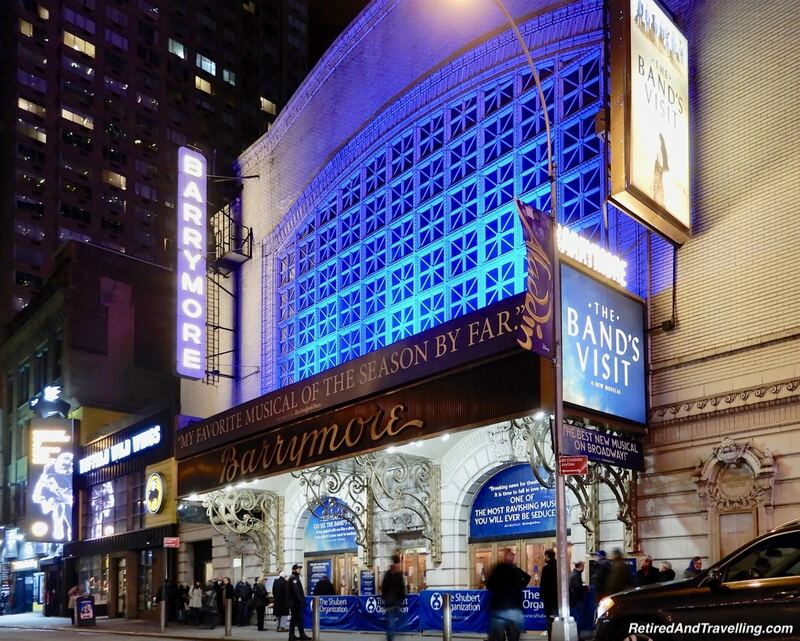 A Broadway show is a great thing to do even if you are on a holiday visit to NYC. We walked a lot in NYC so we made sure to fuel up often. No matter what time or day we showed up, the restaurants were busy. We had pizza at John’s Pizzeria to start our experience. 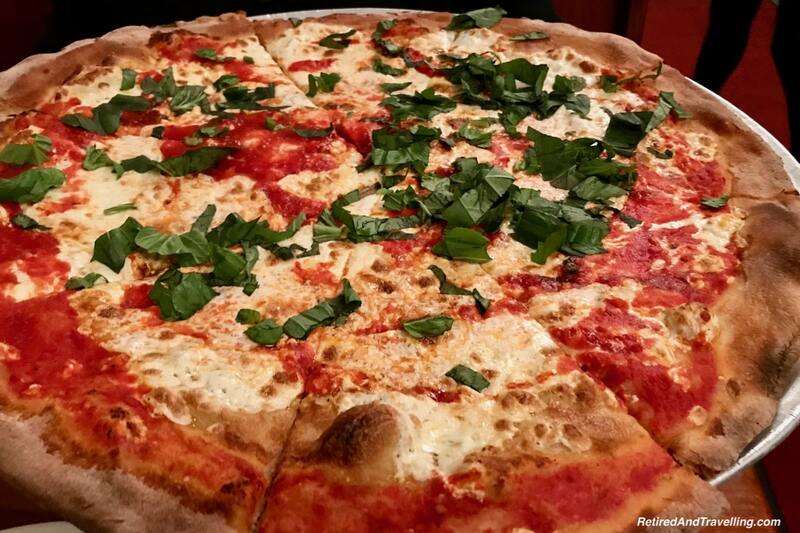 New Yorkers will probably say this is not real New York style pizza. But it was a perfect Italian margarita pizza with fresh mozzarella. They say that you can never go back. We both had memories of eating a mountain of cheesecake on a previous visit. 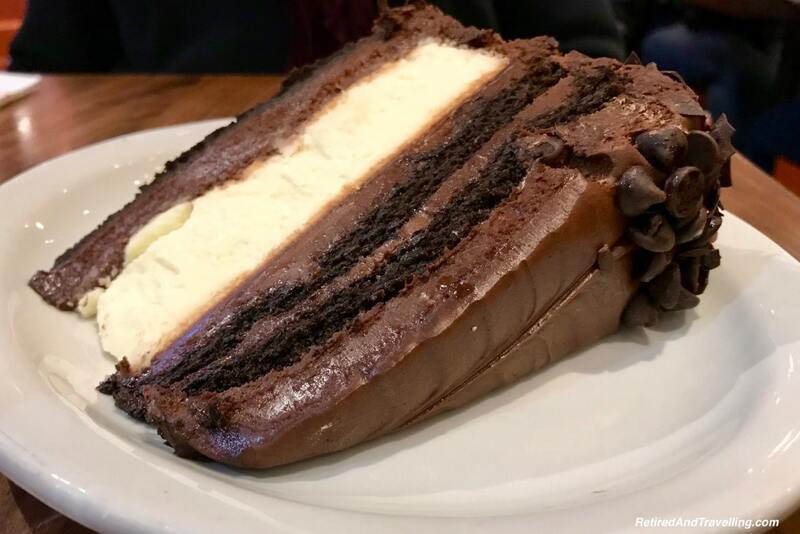 The cheesecake we had at Juniors was a chocolate lovers dream, but put our memories back in line. We got a treat when we arrived at the Intercontinental Times Square. 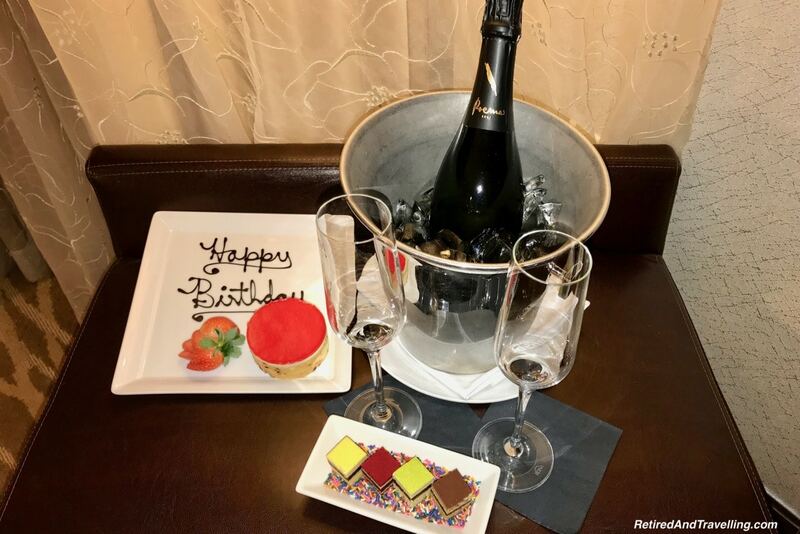 While David’s birthday was still a month away, the cake and champagne were a great way to be welcomed to NYC. The Stinger restaurant in the Intercontinental Times Square is a chef Todd English restaurant. So we made sure to try it for nibbles before we headed out for the night. 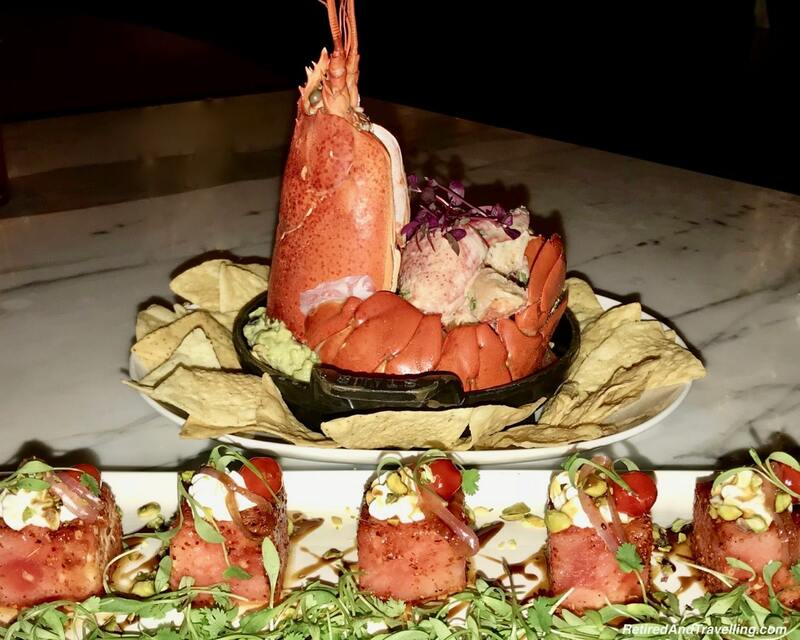 Our lobster guacamole was a perfect complement to the goat cheese watermelon salad. We enjoyed the fire and the Christmas music while we ate. 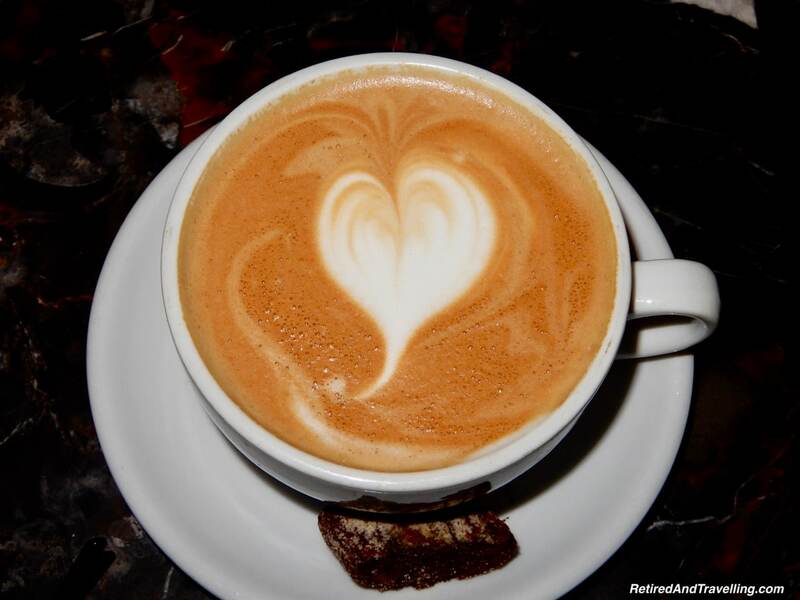 David always does his coffee research in advance of when we visited a new town. He had several spots marked around Manhattan. 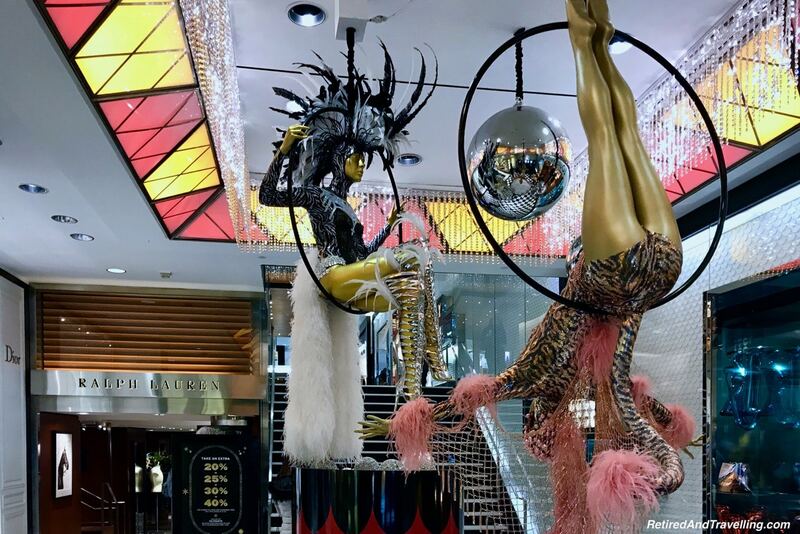 The day we walked along and admired the store windows we stopped at Knave in the Le Parker Meridian Hotel. This little nook was a great, quiet break from the madness on the NYC streets. 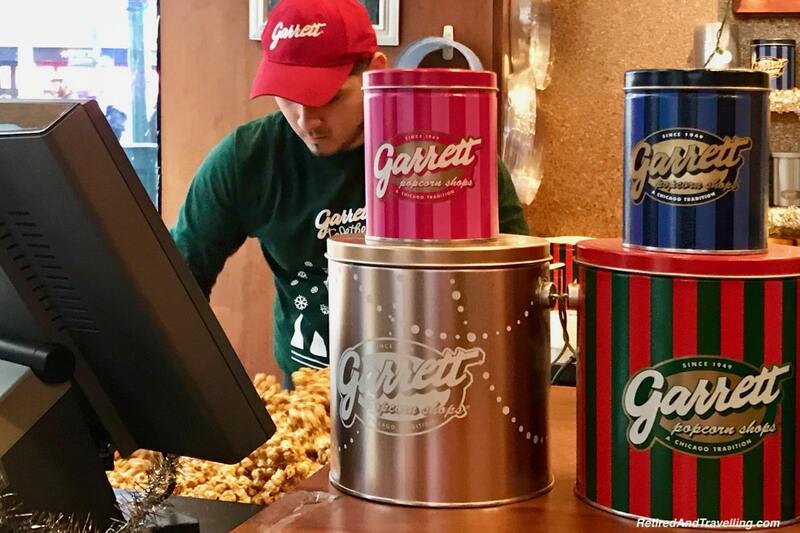 When we visited Chicago in the fall, I became seriously addicted to Garrett’s Popcorn. We did not take back a big enough supply when we returned to Toronto. One day when we were walking, David kept leading me away from my chosen path. I had no idea where he was headed. Then I saw that he had found the Garrett’s Popcorn shop in NYC. I should know that he will never lead me wrong! There were so many food options we had on our plans for our holiday visit to NYC. We never made it halfway through the list. We really wanted to visit Rolf’s German Restaurant to see the great holiday displays. A visit to the Rainbow Room after our Rockettes show never did happen. 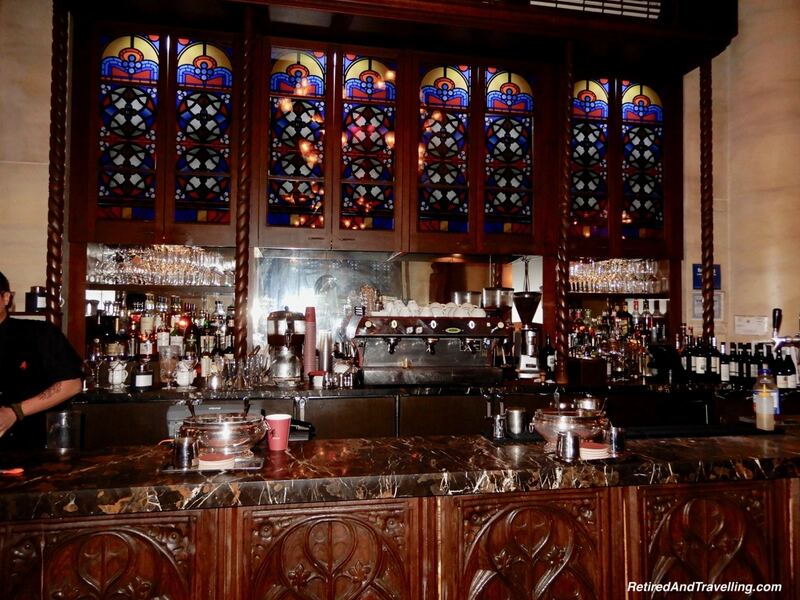 There were several Afternoon Tea spots that are on our list for a return visit. But we did not go hungry on our visit! We were so happy we planned a holiday visit to NYC. Everywhere we went we found the city decorated for the Christmas holidays. 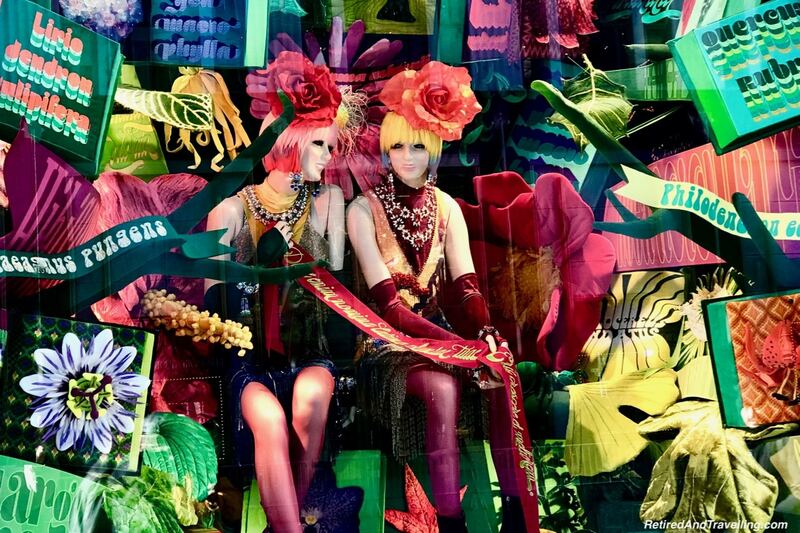 Stores vied with each other to create colourful animated shows. 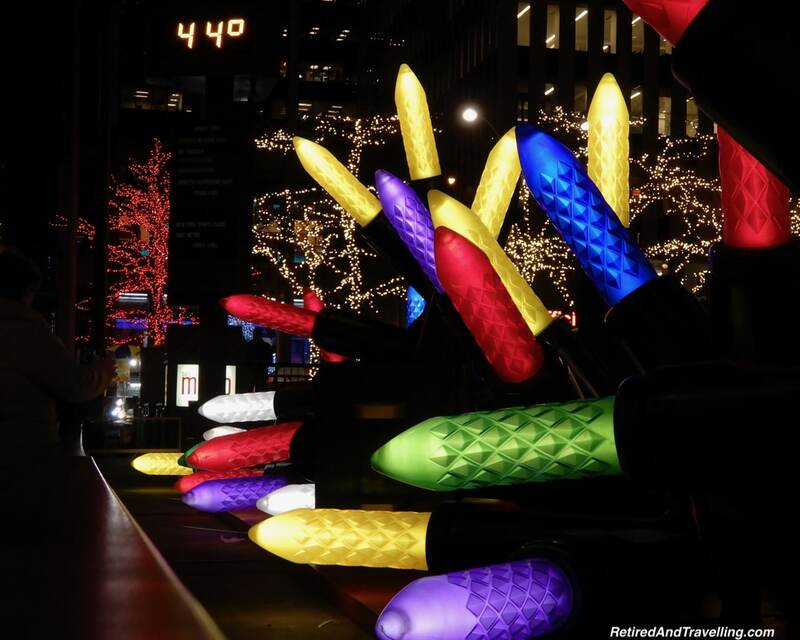 Rockefeller Centre and the Saks Fifth Avenue light show were magical nighttime entertainment. 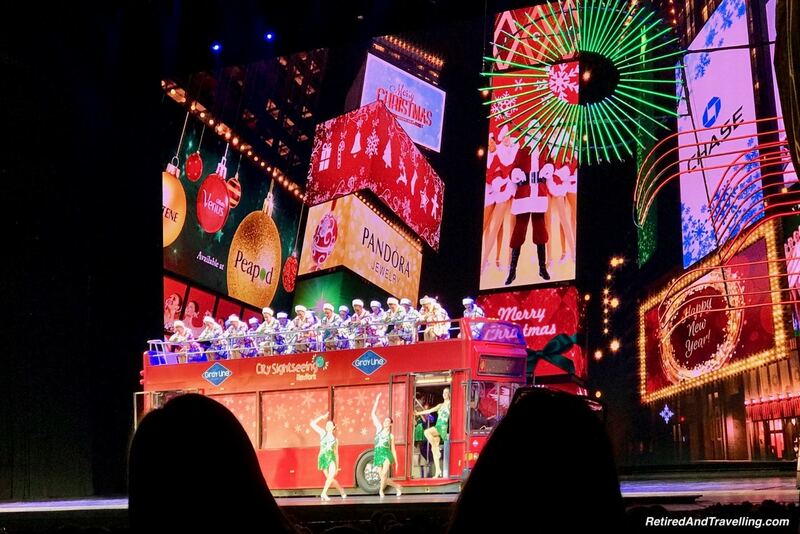 The Rockettes Christmas Special added the icing to our holiday trip. We ate our way around NYC. And we took in a Broadway show. It was no wonder I was exhausted when we finally got back to the airport to leave. 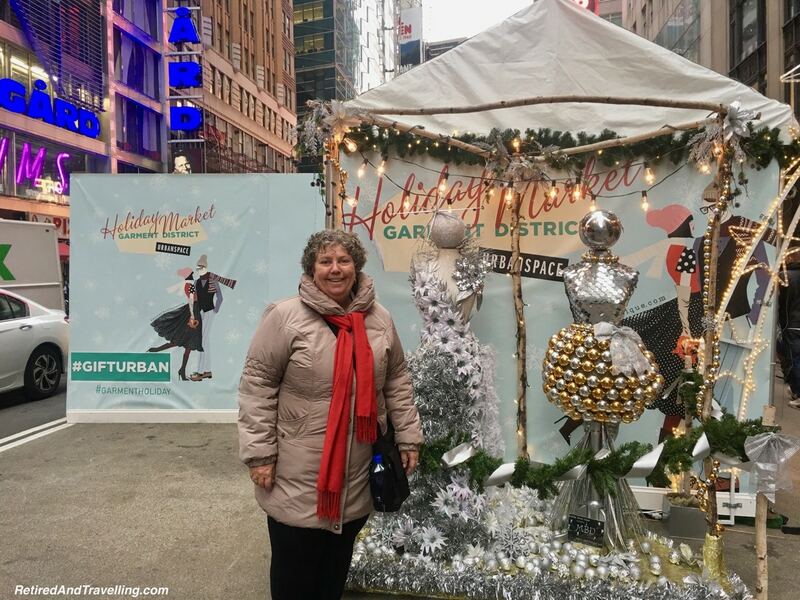 We had really wanted to meet some of the NYC travel bloggers (Lynn from @MadHattersNYC and Nicolette from @Nicolette_O) while we were in the city. But we just didn’t plan well enough to connect during the busy holiday season. 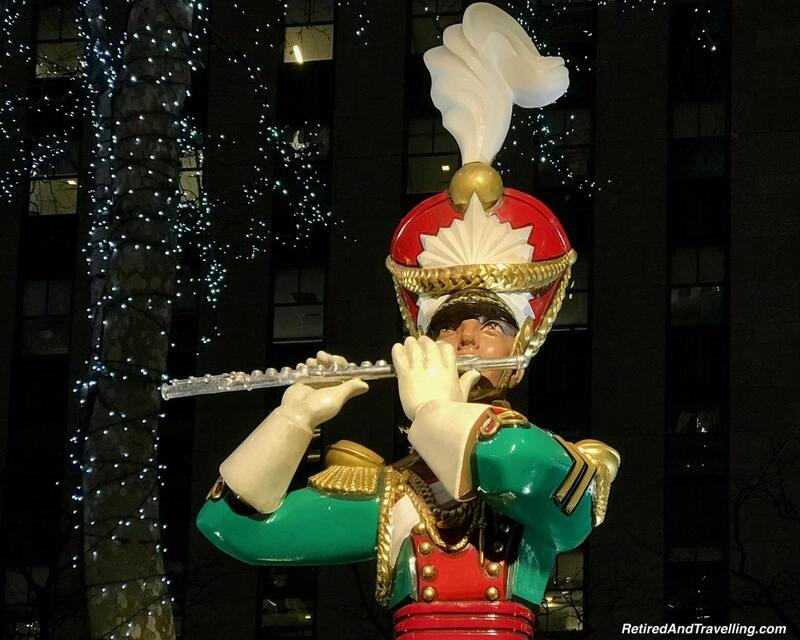 If you want a special Christmas holiday treat, put NYC on your radar for next year! 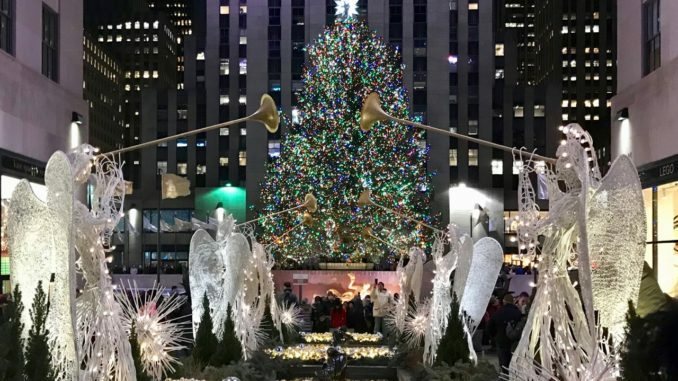 Have you done a holiday visit to NYC? What was your favourite holiday memory? 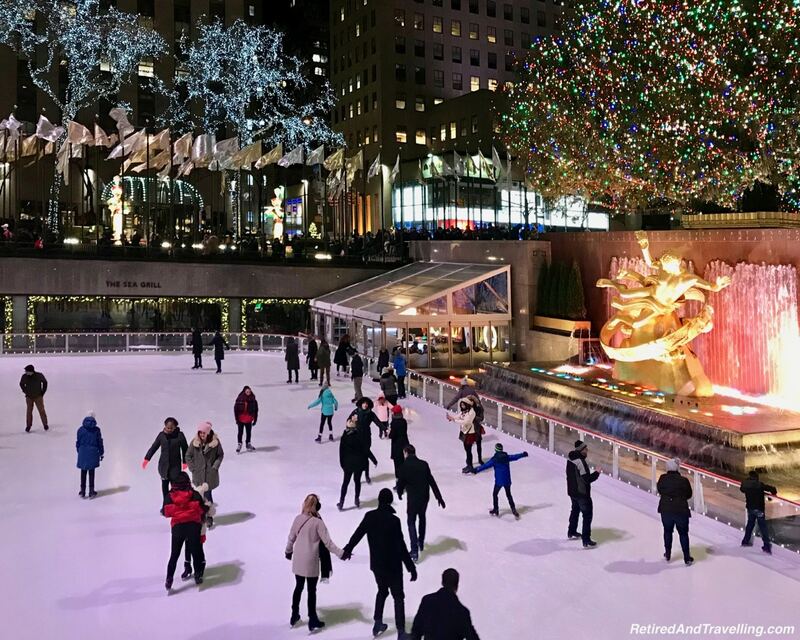 What a great comprehensive post on all the fun things to do around the holidays! I love that you captured the subway fiasco and how you refused to let it stop you 🙂 As always your pictures are top-notch!